We had a fantastic wedding day/wedding weekend in Madeira and everything went to plan and the smile I was wearing in the photo you saw did not leave my face all day! On our wedding day, the hairdresser and her assistant were very good – arrived dead on time and I got lots of positive comments about how nice my hair and make-up looked. The pergola for the ceremony looked lovely in the gardens so we’d recommend anyone getting married outside to opt for one of those! My bouquet and the buttonholes were all beautiful, as were the table decorations for the evening. We were very glad you were able to organise us having Reverend Blair conduct our ceremony as he did a nice job with the order of service and in conducting the ceremony – he even made us laugh a couple of times and helped me feel at ease when I had giddy butterflies as I was waiting for my Dad to lead me “down the aisle”. For our after wedding celebrations that your organised, Manuela was brilliant for our boat trip meal (most of us ended up having both lunch and dinner there on the boat trip day) – she also went to a lot of effort to help us sort out a menu for the evening and even added a special chicken option (with my Mum in mind) which 9 of the 14.5 of us ended up having and I am told it was delicious! Marco and Paulo on the boat were very good – especially Marco who told us lots of interesting info about the island and the sea-life and the boat trip was a big hit was everyone! Finally, many thanks to you Becky for all of your help in pulling everything together and for ensuring that our wedding weekend was so special! Thank you so much for doing our wedding ceremony. We had an amazing evening. Everyone loved the ceremony, thank you for making it so special. I don’t know where to even start to thank Becky for everything she did during the 9 months planning of my Portugal wedding. I found Becky online and sent her an email asking for information regarding getting married in Portugal and to see if she was available to perform our ceremony. Becky was more than helpful but unfortunately was not available for our original date and passed on the contact details of a colleague. I had taken to her straight away, her responses were prompt & knowledgable and she had a very friendly nature. I was disappointed she was not available to perform our ceremony. The original wedding date we had planned fell through so I emailed Becky immediately to see when she was available. She was free on Saturday 11th June so this became our new wedding date. Due to our budget, my husband and I were going to arrange everything ourselves without the help of a wedding planner. Well it turns out I didn’t need one anyway as I had found a celebrant, co-planner, counsellor, and friend the minute I hired Becky. Getting married on the beach requires a beach license – this can difficult to obtain when you don’t speak the local lingo. Google translate had let me down so I emailed Becky – she went out of her way and took it to a Portuguese family to be translated for me. The next thing you need for a wedding is furniture. Again, Becky was able to provide recommendations regarding who to use. We hired Tom from Algarve Marquees based on Becky’s recommendation and he was fabulous – he even provided a hard board for me to stand on so I could wear heels on the beach for the ceremony. Becky sent us a questionnaire to find out more about my husband and I as a couple – how we met, future plans etc. She then used this information to write the most beautiful and personalised ceremony I have ever read. Her email was entitled first draft but no changes were necessary – it was perfect the way it was. We had a few last minute changes to the ceremony and who would be doing what, my husband even changed who would be holding the rings about two hours before we were due to marry – Becky was able to accommodate this without any issue. We discovered the speakers my husband had brought to play music for my walk down the aisle were not holding their charge. I emailed Becky to say we had had our first wedding day disaster – I was only doing this as a response to her email asking how everything was going and how I was feeling, I couldn’t believe it when she responded to tell me that she had speakers and would call to the shop to get batteries for them on the way. Absolute life saver! She also came to the villa to see me and run through the ceremony with my friends before going down to the beach – I think she sensed I was stressed and knew her presence would calm me. She had everything under control. She then went to the beach to meet my husband and ran through the ceremony with the groomsmen. She also informed the local police that we had the license for the ceremony. After the ceremony, Becky again went above and beyond her job description by coming back to the villa and even brought some of my guests with her in her car to help with transportation. At the reception she spoke with everyone, ensured everything was running as it should be and announced for everyone to take their seats for the speeches. Thank you for your time and input to our blessing. We had a great day and your service was lovely. We have been so impressed with Becky and the service she gave us and would recommend her to anyone. She put so much time and effort into making the service as personal as possible so that it felt so much more than a standard ceremony. It really made our special day. From the moment we booked her, Becky was friendly, fun and very easy to talk to but you always felt that you were getting a professional service. Of all the things we worried about in the lead up to our wedding, the celebrant wasn’t one of them. She was always quick to respond to any Email query and was willing to take on and incorporate any idea we had, however late in the day it might arrive. We felt that we always had someone who cared. On the day, it felt like we had a best friend doing our service rather than a professional as Becky is so easy to get on with. She made us and everyone there feel calm and relaxed and that came across in the service and her dealings with everyone involved in the service. All our guests commented on what a relaxed, personal and friendly service it was. Thank you so much for our perfect Wedding and Baby Naming Ceremony. I never imagined the day would be so perfect. When arranging via email etc I never believed it would all just come together, but it did. It was amazing and we loved every minute. Thanks for all of your hard work on a very hot day! Sam and I would just like to say a big thank you for making our day so special. I know I didn’t get much chance to speak to you on the day but it really was amazing. The whole day was perfect and everybody thought the ceremony was beautiful. I just wanted to thank you so much for our lovely ceremony. Everyone commented on you and how fantastic you were and you made it so personable and lovely. We watched back the video and couldn’t stop smiling. 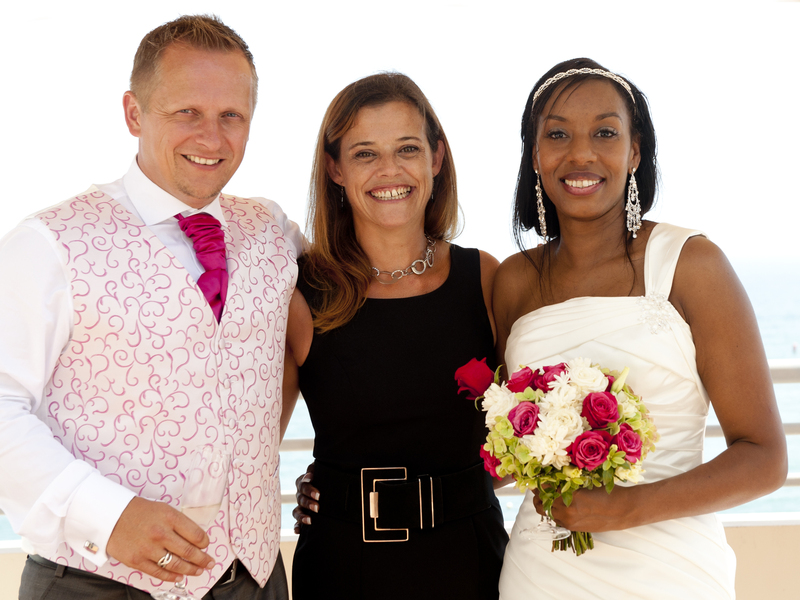 Thank you again and I will definitely recommend you to anyone looking to get married in the Algarve! We just wanted to email to say thank you for everything. Everyone is still talking about the “Warming of the Rings” element – it really allowed all our guests to be involved in our wedding – our rings will forever be filled with warmth, love & well wishes. Love from the new Mr & Mrs Corcoran! Thank you for the magnificent job you did yesterday. It was a stunning day and the ceremony set the tone perfectly. I would like to thank you from the bottom of my heart for the special role you played in our wedding day. From the first wedding video I saw on your website, I knew you were the Celebrant for us. You describe yourself as a “Wedding Celebrant” but the truth is that you are so much more. You provided constant help and support in many other aspects of the wedding and that help was so appreciated and invaluable at times. I’ll never forget the day our first wedding venue cancelled on us, I was devastated but very quickly you reassured me that everything thing would be ok, and as things turned out it was a blessing. We had the most amazing day, and you were such a special part of that. The best compliment I can pay you is to say that it radiates from you how much you love what you do. You have a way of making couples feel like not only are they your friends, but also that they are the only couple you are dealing with at that time, you made us feel so relaxed and we were able to enjoy all the planning knowing that the ceremony was in safe hands. Everything was so personal and for that we are so glad we chose you. It was a real pleasure having you involved and hope to see you again! I can’t thank Rebecca enough for the incredible effort she put in to help me surprise my wife with a Portuguese wedding on the beach. Rebecca went out of her way to change her travel plans to accommodate our requirements and meet us at a beach that I had picked out. Rebecca put a lot of effort into the content of the ceremony itself, she took a real interest in personalising the ceremony to our story. Rebecca has a real passion for what she is doing, and I really appreciate all that she did to help me provide an incredible experience for my wife and myself. I want to thank you specially for the amazing hand written ceremony you wrote for me and Brendan. It totally blew us away. All our guests praised us on the beautiful personal way the ceremony was written and how professional and lovely you were. You helped me hold it together at the saddest part of our day (releasing balloons for our daddy’s who sadly are no longer with us) so thank you. You are a really lovely person who is perfect for the job. I couldn’t have asked for a better ceremony as it was perfect. It was a pleasure meeting you from myself, Brendan and all our guest. Wow ….. Words can’t describe how blown away we were with our ceremony and the beautiful service you provided. Everyone talked non stop about how personal, romantic and beautiful our ceremony was and how it was so about us and our love story. You are truly amazing at what you do, so professional and helpful yet friendly approachable and willing to help in any way. The way you included our daughter Bethany as you knew how much she means to us was simply amazing. Thank you from the bottom of our hearts for making our wedding day what it was. Rebecca, just a quick thank you very much for a wonderful ceremony. You made our wedding day extra special. The whole of my family were talking about how wonderful your reading was. We cannot thank you enough. When we started planning our wedding in Portugal from England we thought we must be mad! We started with the Your Portugal wedding website which is Fantastic. We booked all of our suppliers from this website and it really is very useful. We decide to choose Becky for our celebrant which was a very easy decision. We met with Becky one afternoon when we were holidaying in Portugal. Becky is so efficient and knew exactly what we wanted for our ceremony. Neither of us like to be the centre of attention and the ceremony that Becky wrote was us to a T! Becky emailed me the ceremony before and she personalised it to how we wanted. I cant thank Becky enough for giving us the most beautiful ceremony. As most brides will understand organising a wedding from another country can be extremely daunting. Becky was fantastic and filled me with every confidence. I cant recommend her and her website highly enough. Thank you Becky for all of your help and giving us the most memorable ceremony. Becky, the ceremony was perfect. You did an amazing job !!! I loved every second. It felt such a magical day. Thanks for all your hard work with it all . Pierre and I wanted to send you a quick message to say a massive thank you! There ceremony could not have been more perfect. We felt that it went really smoothly and it had an excellent mix of laughter, emotion and seriousness. We cannot thank you enough for keeping us both really calm and ensuring that the whole thing came together flawlessly. We have been looking back at the pictures and they will be a great reminder of what a perfect day Saturday was, in part thanks to your role. We just wanted to email to say thank you again for such a wonderful ceremony – it was exactly what we had hoped, and all our guests were so impressed at how lovely and personal the ceremony was! We have shown our DVD to friends and family who couldn’t make it, and they too have been full of compliments! You were so professional and friendly throughout the whole process, and we couldn’t have asked for a more wonderful ceremony! We were also so grateful for all the bits of advice that helped it all go smoothly! The party carried on late into the night, with a lot of our friends jumping into the pool and then sitting in the jacuzzi in their clothes – very surreal but amazing! So thank you once again for everything! Hope all is well in Portugal – not a day goes by when we don’t wish we were back there!! I just wanted to say a huge thank you for your part in the ceremony, it was such a beautiful ceremony and we had an incredible day. Everyone commented how special the ceremony was and what an amazing job you did so thank you. Thank you so much for such a lovely ceremony. I can’t wait to see it on the video. You made us both feel so relaxed and at ease and everyone has been commenting how it was the best wedding ceremony they had ever seen. Would love to catch up next time we are in Portugal. I just wanted to say a huge thank you for Saturday. You were brilliant and we had loads of lovely comments about how great you were and how sincere it all was. We loved every minute and you made it very easy to enjoy every second. Thank you SO MUCH for being a part of our big day! The ceremony was beautiful. We cannot wait to grow a rose garden back home! Becky…Well, what can I say! We had the most wonderful day of our lives, it couldnt have been more perfect, and you made it happen! The day went by so quickly and that was the only downfall. It feels like a dream now, I keep trying to remember every last detail and it feels like it was 5 minutes in total. The ceremony was so meaningful and I couldnt have asked for a better Officiant. I can honestly say that it could not have been better in my dreams and I really appreciate what you did for us to make the day so special. Thanks so much again and I look forward to meeting you again in the near future. Becky was the first person I had written to when I started to prepare my Russian Wedding in Portugal. She gave me a start and she was the most warm-hearted and responsive person during all the preparation!! The text of the ceremony was beautiful and personalised for us! Becky mention many things important for both of us. She came to the venue beforehand and she made sure that all the final details were ready and everything was OK. Becky, you made our wedding ceremony beautiful and touching! Thank you very much! Dear Becky. We keep reminiscing about our beautiful wedding day and the one word that best describes it is “magical”. We can not thank you enough for your hard work in preparation of our so lovely ceremony and the actual beautiful moment. Our happiness is beyond words about how ideal those special moments were. Thank you for all you did to make our wedding ceremony forever memorable in our hearts. We used Rebecca as our wedding celebrant for our ceremony in September and were delighted and touched by the service that she created. Rebecca learns about you both and your story and weaves these details into a ceremony that is personal, meaningful and individually tailored to the pair of you. I cried at the first draft- but in a good way! Our ceremony was exactly as I’d hoped and dreamed, and that was down to Rebecca. Thank you! There are two words we can use to describe Becky De Sancha and the service she offers………absolutely fantastic! Becky’s enthusiasm, support, help and advice were apparent right from our first email contact. Even when things started to go wrong for us, with our ceremony butterflies not arriving, in steps Becky and changes our ceremony at the last minute to incorporate new ideas that she thought of for us the night before! She was like the Celebrant, Chief Bridesmaid, and friend all rolled into one. So much so, other people in our wedding party asked for her number as they wanted to use her to renew their vows. With all that in mind all we have left to say is …….Becky thank you for making our wedding the most special and important day of our lives……….we love you!!! !